My name is Thierry Dezarmenien and I am currently a freelance character animator. Nothing crazy really, I was a graphic designer. The project I am working on right now, it is a short film and I am super happy and proud to be part of this team. I don’t even remember, it’s seems I was always interested in it. But Something sure is the feature film Aladdin from Disney definitely change me, there was a Thierry before watching Aladin and a Thierry after. Because after that screening in 1992 I knew I wanted to be an animator and nothing else. I am from France, I get into animation after graduating from a 3d art school in France, after that I made my way to animation by starting to work in the gaming industry. I open my eyes, give a kiss to my wife, wake up switch on my computer, get dressed, finally having breakfast, then checking my email, launching Maya and everything. I wish I could switch On my computer before opening my eyes, but so far I didn’t find a way of doing it. Softwares crashes, let’s all go back to traditional animation! Pencil, paper and light box, yeah! A computer, an intuos4, This year I am gonna ask a cintiq21 HD to Santa. Finger cross. I feel a bit like a nolife sometimes. Weeks can pass before I call my relatives and family. Yeah…I am not sure about the meaning of that question, lol. Sorry to be french, my English have to be broken, it is mandatory. (one google translation later) I met Eric Goldberg once, on a Flipbook booth a few years ago during an animation festival in France, Annecy. he was animating, and he made animation look so easy it is insulting. 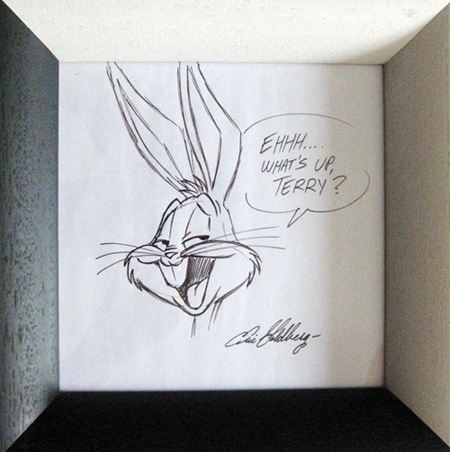 He dedicated me a Bugs Bunny, I still own this Sketch up on my wall. It was funny because everybody asked him a genie, I was probably the only one to ask him to draw the character he liked the most animating, so he sketch a Bugs Bunny. I start working at 15 years old. It was pretty tough back then to be in the professional world at first. But I made my way and here I am. Tougher than before. With my wife we want to do a new short film but right now we are only on the writing process. And obviously I keep making new scenes for my demoreel. I can put the top part of my ear inside my earhole. NO! The place is full go away, leave your pencil and get a real job! Nah just kiding. My advices is to be curious about everything, animators need to have a lot of knowledge to help them on the creation process. And keep drawing, the best animators on the planet are the greatess rough man, so keep drawing. Tagged Character Animator, Disney, Graphic Design, Maya, Wacom Cintiq. Nice work, Thierry! You might try try consulting an IT person about setting your computer to turn itself on before you get up. I have my computer set that way. Interesting! I was just passing by and I saw your name, wich sounded familiar to me. That’s funny, I was one of your student this year hehe. Still, I find that interview interesting. And you met Eric Goldberg! And I should say that software crashes and being a nolife are part of the job.